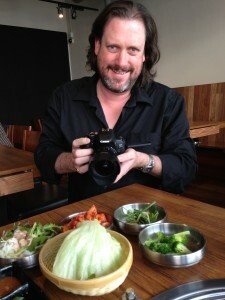 Making sure the Samyang 24mm felt at home here in Australia with a little Korean food. The fast Cine Prime lenses coming out of the Samyang factory in South Korea have been intriguing many people recently and I’ve had the chance to road test their 24mm T1.5. For film makers coming from both the film and video worlds the proliferation of large sensor, single sensor cameras has opened a vast array of new lens options. High end cinema lenses, lightweight SLR lenses and even vintage glass that haven’t seen the light of day for years can now all be at home on a very wide range of cameras. In the last year alone I’ve been enjoying using many of these lenses from familiar names like Zeiss, Canon, Sony and Cooke. With so many choices for great and diverse lenses it would seem hard to find a gap in the market. In many ways the South Korean lens maker Samyang has done exactly that. Firstly, they began offering some extreme lenses like their popular 8mm fisheye and then followed this with a series of fully manual SLR lenses at a much lower price point than the other options on the market. They have now seen that their manual lenses have been popular with film makers for the direct control of the lenses with some people even having the lenses modified to “cine” style lenses typically by de-clicking the aperture and adding focus gears. Samyang smartly reacted to this trend by producing purpose built Cine versions of their 24mm, 35mm & 85mm fast standard prime lenses and I’ve been testing the 24mm T1.5 (also produced under the Rokinon & Bower names). The first impression on picking up the lens is that it’s solidly built and although it does use some plastic on the outer barrel, the unit looks and feels very neat and well made. There are film standard 0.8 pitch gears on both the focus and aperture rings and these are very much built into the lens with only the teeth of the gears sticking up from the surface of the barrel. This is one advantage of a purpose built cine lens over converted lenses. I was testing the lens with the EF Canon mount and the next notable thing if you’re used to looking at the back of EF lenses is that there’s no electronic contacts. These are truly manual lenses with no motors and no communication with the camera and that adds a different degree of precision and also makes big adjustments instant rather than a series of clicks or turns of a dial on the camera. For video work this is a big plus. The focus and aperture scales are also on the left side as with other cine lenses as opposed to on the top as with stills lenses. Back of 24mm with no electronics. The aperture is also calibrated in T-Stops which is a small issue with these sort of prime lenses because there’s not a huge difference like there is with most zooms. But still, it’s nice to know exactly how much light is getting through the lens at any particular stop and any bit of extra precision with exposure is a good thing. Being completely manual means that the “hard stops” at the ends of the focus range are a physical function of the lens. So even without a follow focus it’s possible to repeat a focus change and the same turn on the barrel will always result in the same focus change. Although I haven’t tested the 35mm & 85mm, these elements are consistent with their design as well. In some ways the lens reminds me of a Mark II Superspeed in shape, size and weight and there’s a lot of situations where that’s a good thing. Another way of looking at it is that it is about the size of a 24-105 L-series Canon not extended. One of the first things that caught my attention about the Samyang cine primes is that they haven’t got the very large focus barrel that most modern cine lenses have. While there are proportionally large advantages of the big focus ring on lenses like the Canon Cine primes or Cooke S4’s there are also a lot of situations where a smaller lens is worth the trade-off (don’t ask a focus puller to back me up on that though!). It would be easy to carry a full set of Samyangs with a DSLR in a backpack kit, in a way that’s not really practical with the bigger lenses. 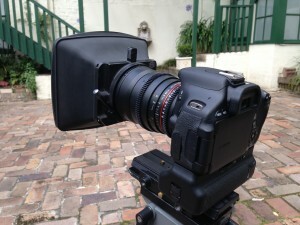 Samyang 24mm Cine with lightweight clamp-on mattebox. In operation the lens is completely internal focusing with no change in the length of the lens and no rotation of the filter thread. This is very important because it makes it possible to use screw-in as well as clamp on and rod mounted matteboxes. Being able to use screw-in and clamp-on matteboxes is another big advantage for building a very lightweight kit. The aperture scale is compact but I found it easily readable and had no problem setting exposure to a tiny fraction of a stop anywhere in the 1.5-22 stop range. The aperture and focus rings both have smooth movement with a good amount of resistance. 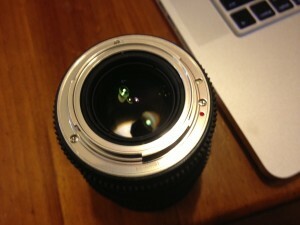 One small thing worth noting is that there is a slight sound from the movement of the focus ring. This would only be an issue if you were shooting up close in a quiet environment with a big focus pull. Certainly not an everyday situation for most of us but not unheard of either, so it is worth being prepared for. I used the 24mm on a couple of Canon DSLR’s, a Red Epic and a Sony EA50 using the Metabones EF to Sony E-Mount adaptor and it mounted and operated perfectly on all of them. 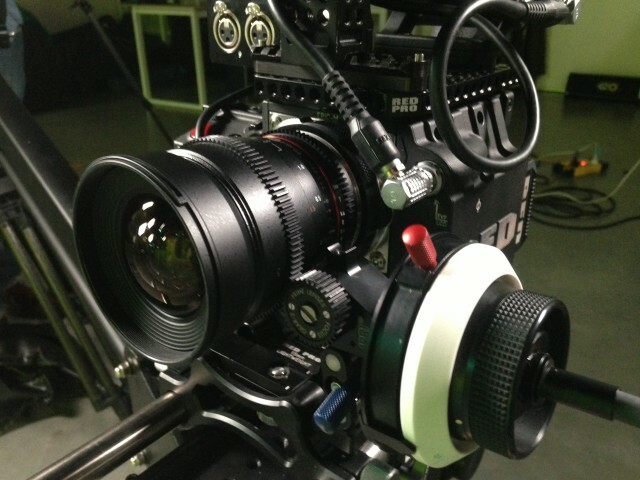 Samyang 24mm Cine lens on Red Epic with follow focus. The big question of course is what do the pictures look like? The short answer is pretty good. The overall image is sharp and clean while not as clinical as some lenses. The sharpness holds very well between T2 and T11 and drops off a little outside of that range. I doubt many people will use a lens like this very often, stopped down past T11 but T16 & T22 are still very useable, say if you were doing daylight timelapse. Given the option using ND filters to bring it back will be well worth the effort. 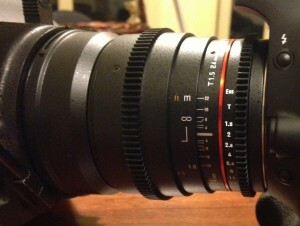 The 24mm’s circular Bokeh at T1.5. At the other end of the scale, if I was doing a big wide shot with enough exposure room, T2.8 gives a nicely crisp image. At T2 IT looses just a little sharpness and at T1.5 a little more. If I was using this lens for say an interior drama scene where I would want the extra stops and the shallow depth of field then the slight drop in sharpness is something I’d be entirely comfortable with. It’s also slight enough that it looks very flattering on faces, without looking at all diffused. It’s worth bearing in mind that this is a lens designed originally for full frame sensors, so using it on cameras with smaller chips does mean you’re taking a section out of the middle of that glass. At Super 35 / APS-C size this is no problem but I would be just a little careful about which circumstances I would shoot wide open if I was using it on a Micro Four Thirds camera. Using the virtual zoom on the EA50, I was able to get a sense of how it would look on S16 sized sensors (including the Blackmagic Pocket Camera) and it still produces a nice image but would struggle a bit wide open. I found a little chromatic aberration and that’s no real surprise for a lens in this price range, but as soon as you stop down it is very minimal. You can get a visible lens flare out of the 24mm but it does look quite nice to my eye and is easy to control if you don’t want it. 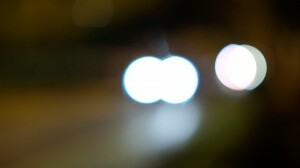 The bokeh is circular and has some character to it. There is a little bit of breathing through the focus range. It’s fairly minimal, but again something to be aware of for those occasional situations where it could be an issue such as VFX. There’s lots of reasons to chose this lens. For someone who’s been using stills lenses and want something that will work easily with film style accessories and give a lot more direct control over focus and exposure it makes perfect sense without having to make the leap up to something like the Zeiss CP.2 glass or Canon Cine Primes which are really the next step up. Equally I could imagine someone with a pile of bigger cine lenses who wants a smaller, lightweight option for the times and places where that’s an issue, without having to give up the power to grab the focus or iris and set it to exactly what you want. Samyang have found an interesting niche where it’s actually quite difficult to compare them to anything bacause there’s really nothing quite like them. More control than stills lenses for video, purpose built cine design that’s hard to match with even a very good conversion while smaller, lighter and a fraction of the price of “low cost” cine primes from the big manufacturers. While in many ways the best comparison is with the old Zeiss Superspeeds like the Mk II or Mk III’s, those lenses are so sought after now that they are hard to find even if you’re prepared to pay the asking price. There are there sacrifices for all those advantages but they are small and manageable. The Samyang 24mm T1.5 sits in a unique place in that market and for anyone who is looking for that combination of features it’s a superb solution. The test unit for this review was supplied by Glenn Ward at Maxxum, the Australian distributor for Samyang.